Alexandra Franzen is a firecracker. There is no better word to describe this exuberant, enthusiastic, wordsmith, but I'm sure she could think of about five thousand more. That's what makes her work so fascinating -- the passion and excitement she brings to the written word. With Thanksgiving right around the corner, Alexandra has written the perfect book to help us all express our thanks and gratitude. Describe your background and what lead you to a career as a blogger, author and writing teacher. What are some of the significant steps you took to bring you career success? My love affair with language began at age four. One dreamy Southern California morning, my parents took me to the local coffee shop. We walked up to the counter, and they asked what I wanted to drink. Being responsible, health-conscious adults, they were hoping I'd say "a shot of wheatgrass!" or "unsweetened herbal tea, please!" But -- while I couldn't really "read" -- I'd learned how to recognize two very important words: "hot" and "chocolate." So I told my parents, "I want hot chocolate." They replied, "Sorry, sweetheart, they don't have that here. Why don't you choose something else?" But I pointed to the sign and said, with great enthusiasm and conviction, "Yes, they do." My parents were stunned. I got my frothy treat. And in that moment, I learned a valuable lesson: When you use the right words with the right people at the right time -- with a smile! -- you usually get what you want. I've been fascinated by the power of language ever since. And from my teenage years as an English tutor, to my college days in student journalism, to my early career as a freelance technical writer, to my stint in public broadcasting, and today, as a copywriter and writing teacher, words have always been my work. These days, I'm particularly fascinated by the art of "compassionate communication" -- which I define as "using your words to get what you want while giving, not taking." What inspired you to write 50 Ways to Say You're Awesome? Every time you place your fingers on the keyboard to write -- or open your mouth to speak -- you have an opportunity to add to the love in the world, or subtract from it. Ultimately, all of my work is about inspiring people to be Adders, not Subtractors. 50 Ways to Say You're Awesome is a collection of "thank you" note scripts & templates, but essentially? The book is a simple reminder to be an Adder, every day. It's not a complicated message, but I think it's one that I -- and many others -- need to keep hearing. You wrote recently on your blog that you believe a template is a great way to help people write. Do you utilize templates when writing? Do you outline? What are your writing habits? Writing templates are like bicycle training wheels for your words. They can help you get up and rolling, when you're feeling unsteady or stuck. I absolutely rely on templates when I'm writing -- although at this point, the templates are so deeply ingrained in my brain, I don't really think of them as "templates" anymore. They're just ... the way I write. I don't have any highly-rigid writing habits, but I do try to capture ideas the moment they percolate into my brain -- recording them onto my phone while I'm walking around town, or jotting them down in the middle of a Skype conversation, or hopping out of the shower to scribble something on a soggy Post-It note. I love writing on airplanes, on trains, in noisy coffee shops, even biker bars! Total silence is distracting, for me -- I like a bit of ambient chatter. Right at this moment, I'm at a café. Hmmm ... does "drinking copious amounts of coffee" count as a "writing habit"? What is the best piece of writing (and business) advice that you have ever been given? A wise woman once told me: "Don't hoard your best ideas. Be generous. There's always more where that came from." That philosophy of generosity has informed everything I do and create. It's quite true. There's always more where that came from. Your mind is endlessly abundant. What is the best writing (and business) advice that you would give to aspiring writers? "Start with love. Keep it simple. You are not confused." Don't overanalyze, overedit and overthink every move. Just write. Just create. Just be helpful. Do that ... and you really can't go wrong. With Thanksgiving right around the corner, gratitude is more important than ever. 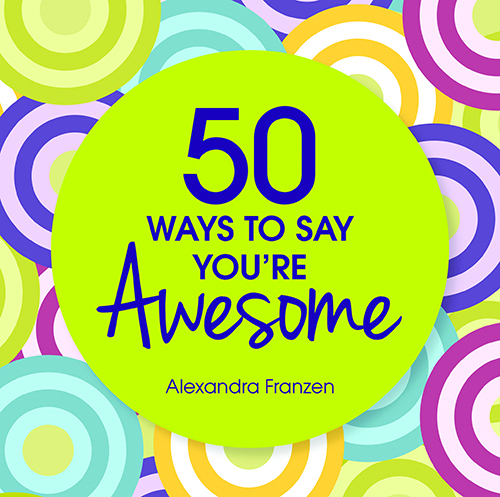 50 Ways to Say You're Awesome beautifully embodies this sentiment. Do you find that in writing your book (and publicizing it) you are becoming more aware of the importance of gratitude? How has it changed your life? What is your advice to people wanting to express more gratitude on a daily basis? Over the past few months, as I've connected with hundreds of new friends on my workshop and book tour, I've been astonished by the gratitude stories that have come pouring forth. What these stories show me is that we are all aching for appreciation. For validation. For real, human connection. We're all aching for somebody to look us in the eye -- or send a handwritten note -- and say, "You touched my life. You helped me out. The world is better with you in it." Of course, writing a "thank you" note isn't the only way to express your gratitude. There are infinite ways to be generous of spirit -- and most of them don't cost a penny. You can pick up the phone and call, instead of sending a text message. You can make eye contact with the person in front of you, instead of half-scanning your smartphone screen. the dots on their own. In my own life, I've noticed that when I express my gratitude to others, I tend to receive a lot more appreciation in return. Gratitude is a positive sum game. Win-win, for the whole world. What are the most "awesome" aspects of your life and how do you nurture them? I'm blessed with an outrageous amount of awesomeness. Right now, I'm especially grateful for ... my (awesome) family. My (awesome) friends. My (awesome) clients, students and readers. My (awesome) creative team, supporting my writing and business. My (awesome) publishers at Sourcebooks. And for ... my health. My sanity. My hair (it's pretty glorious). The fact that coffee is a legal drug, in all fifty states. Online dating (ha! It's miraculous). New adventures. New projects. Possibility. I try to express my gratitude to at least one person in my community, daily. Telling and showing people how much they mean to you is THE simplest way to nurture relationships, and keep the gratitude flowing in both directions. So obvious. But true. In 2014, I'll be rolling out another 10-city workshop tour -- with a few surprise guests and twists, along the way. I'm also starting a "script of the month" club -- a full year of fill-in-the-blank email scripts to help people express themselves in tricky scenarios. With clarity. And with love. Second Firsts: Live, Laugh and Love Again by Christina Rasmussen. A fascinating approach to reinvention after grief and trauma. Zen Under Fire: How I Found Peace in the Midst of War by Marianne Elliott. We share the same publisher -- Sourcebooks! The Mastery of Love: A Practical Guide to the Art of Relationship by don Miguel Ruiz. It was recommended to me by three different friends. Finally, one gave it to me! The Warded Man by Peter V. Brett. Fantasy novels are my #1 guilty pleasure! Except ... I have zero guilt. What are your top five favorite writing and/or business books? The Right to Write: An Invitation and Initiation into the Writing Life by Julia Cameron. I love her no-nonsense philosophy: "Did you write today? Then you're a writer, today." The Fire Starter Sessions: A Soulful and Practical Guide to Creating Success on Your Own Terms by Danielle LaPorte. A brilliant guide to life and business design. Design Your Self: Rethinking the Way You Live, Love, Work, and Play by Karim Rashid. I want to be like Karim when I grow up. The Declaration of You! : How to Find It, Own It and Shout It From the Rooftops by Michelle Ward and Jessica Swift. Playful, charming and stupendously fun! The Art of Communicating by Thich Nhat Hanh. I saw him speak at a university, back when I was 18. I've adored him ever since. Compassion is always the best "communication strategy." I'm confident we will be hearing (and reading) much more from this dynamic writer. For more inspiration, visit her website and stay-tuned for her upcoming work. Thanks, Alexandra, for the much-needed jolt of optimism, enthusiasm, and joy through the written word.